[Monterey County, CA] – On April 26 from 10 a.m. to 2 p.m. the local law enforcement agencies and the Drug Enforcement Administration (DEA) will give the public an opportunity to drop off prescription drugs. Sun Street Centers’ PARTS Coalition members will hand out prescription drug information and provide awareness of the potential safety and health hazards throwing prescription drugs in the trash or flushing them down the toilet. Help us prevent pill abuse and theft by properly disposing of potentially dangerous expired, unused, and unwanted prescription drugs. 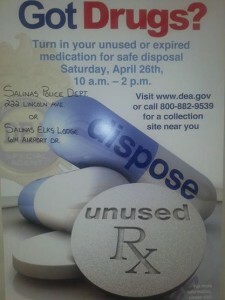 (The DEA cannot accept liquids or needles or sharps, only pills or patches.) The service is free and anonymous, no questions asked. Last October, Americans turned in 324 tons (over 647,000 pounds) of prescription drugs at over 4,114 sites operated by the DEA and its thousands of state and local law enforcement partners. When those results are combined with what was collected in its seven previous Take Back events, DEA and its partners have taken in over 3.4 million pounds—more than 1,700 tons—of pills.